The adoption of performance-focused budgeting and a program structure for expenditure has been evolving for some time in Indonesia. The transition to the practice of performance and program-based budgeting was intended to allow the public to see: 1) the relation between inputs (funding) with the expected outputs and outcomes; and, 2) the effectiveness and efficiency of programs and activities. However, as a staff member of the budgeting directorate in the Ministry of Finance admitted in an interview, the reform is yet to be fully implemented. 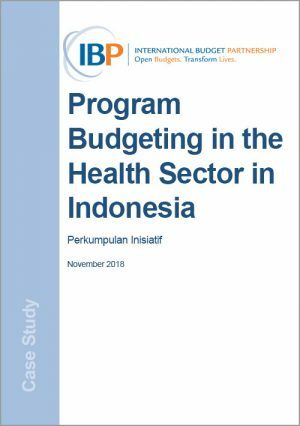 This case study examines program budgeting in the health sector in Indonesia. The authors examined Indonesian legislation and budget documents, and conducted several interviews with resource persons from relevant institutions to collect information on Indonesia’s implementation of program-based budgeting and all of its accompanying challenges.